Well done Angus Spence ???? We will be in touch to organise getting your Hamper to you. We would like to take this opportunity to thank you all for getting involved and pledging your support for our Project. We have been overwhelmed by the generosity of each an every one of you. A little look at what is involved in getting our Delicias jams to you ???????? 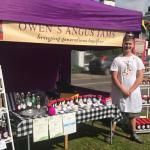 Today has been a busy day, meeting at Glamis this morning, organising promoting our jams at the Christmas Market next month. Followed by a large delivery to Longparke - the 3rd In 2 weeks???? That means the next few days will involve making pot after pot of jam???? Wow, we are off to an amazing start! In just nearly 2 days we are over the £1000 mark! I am so grateful to each and every one of you for supporting me so far.